Sign up for adventure with an Outdoor Rock Climbing Class with Hard Water Sports. All classes focus on safe climbing practices. Classes will also cover the fundamentals of movement, knots and hitches, equipment selection, route finding and much, much, more. All climbing classes are priced at $65 per person – Climbing shoes, harnesses and helmets are provided. Looking for an outdoor climbing adventure for your group ?? We can make it happen !! Call Hard Water Sports for group rates and available dates. Our guides believe in a “leave no trace” philosophy, we welcome everyone to participate in our classes and adventures. 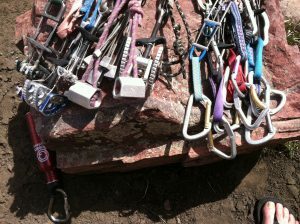 MNclimbing.com is a Hard Water Sports website focused on our rock and ice climbing guide service.